For years, the more than 1,000 students at McKinley Elementary School in Newark's Central Ward, had nothing but a virtual wasteland of asphalt for a playground: A shabby dumpster at one end, a few rickety basketball hoops at the other, all surrounded by ten-foot-high chain-link fencing. In May 2002, plans for a new playground were developed through a participatory design process in which students took on tasks ranging from surveying the site and interviewing community stakeholders, to working with professional architects. 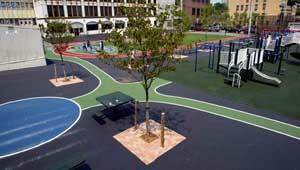 Completed in 2003, the two-acre park includes a track, basketball court, grass playing field, swings and play equipment that is available to students and the community. This is the sixth community park created TPL's Parks for People-Newark Program, a groundbreaking public-private partnership dedicated to providing permanent, community-managed recreation spaces throughout the city.